It is astounding that our ancestors survived Halloween. Every October, we hear rumors about poisoned, drugged, or booby-trapped candy. Area hospitals offer to X-ray the loot-filled bags of trick-or-treaters and the local constabulary provides tips for detecting tampered sweets. 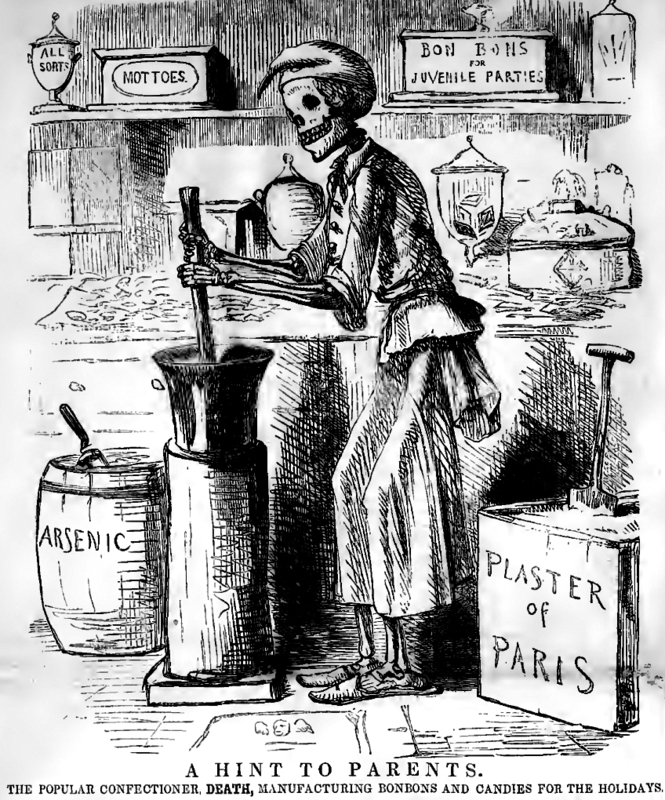 As far back as 1858, when Harper’s magazine published this cartoon, it was common knowledge that candy-makers mixed poisons into their confections, but it was only in the 1920s that efforts to regulate purity became common. The newspaper admitted that such homebrew chemistry was unnecessary. Candy makers readily quoted prices for adulterated versus pure products because there was nothing illegal about adding terra alba to their recipes. For some manufacturers, even terra alba was too pricey – they cut their candies with Plaster of Paris. As early as 1882, Cincinnati candy makers banded together in a Confectioners Union to agree on reasonable standards of purity in the production of candy, but it was only the intervention of city, state and federal inspections after 1920 that allowed a level of confidence in the safety of the Halloween haul.